Literizing and it feels so good! I’ve read a number of helpful pieces on writing, blogging and the creative process. On WordPress alone you can find lots of articles on grammar and theme development, how-to posts with writing exercise topics, etc. This is all good stuff. But to someone like me, who is pretty sure that Strunk & White was a singing duo with a disco hit in 1978, writing is a lot more elemental. I write to avoid doing hard time. Writing, and by extension blogging, acts as a coping mechanism. That is psychobabble for a way to handle stress that doesn’t hurt anyone, and keeps my picture off the front page of the local paper. 1) Idiot cuts me off in traffic. 2) Kids trot off to college, abandoning hubby and me. 3) Can’t move at Wal-Mart because of all the clueless zombies milling about. 4) Cannot resist Christmas tree-shaped Little Debbie snack cakes calling out to me. In each case, I chose Option c – write about it. Wait a minute. Nope. I didn’t write a post about the first situation. May have gone with Option 1a there. Writing allows me to wrangle daily life into some semblance of manageability. To wrestle with reality, put it in a headlock, tie it up and leave it, bloody and dazed, on the ground at my feet. How’s that for a metaphor! Or is it a simile? I always get those confused. I don’t think Metaphor Is Like A Simile was on my Strunk & White record. Must have been on their Greatest Hits album. This entry was posted in General Ramblings and tagged blog, blogging, humor, life, musings, postaday2011, postaweek2011, Wal-Mart, why I started a blog, writing. Bookmark the permalink. Was that you I saw on Cops the other night, wrestling with reality? Very impressive. If you ever get tired of writing, there’s a place for you with the WWF. Fabulous! I want a front row seat. I’ll throw the first chair in your honor! I’m glad you have this outlet. Because I enjoy it very much. Keep ’em coming. Strunk and White are probably turning over in their graves at the thought that they have been misconstrued for a black, corn-rowed, Disco-singing duo from the 70s!! They would also probably disapprove of my use of two exclamation points at the end of a sentence!! 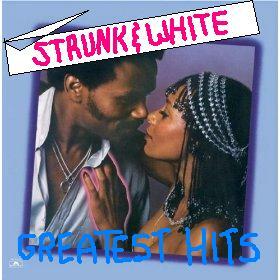 I wonder how Peaches & Herb feel about being misidentified as Strunk & White?